Advocatus Atheist: My Response to Randal Rauser will be a published book! My Response to Randal Rauser will be a published book! 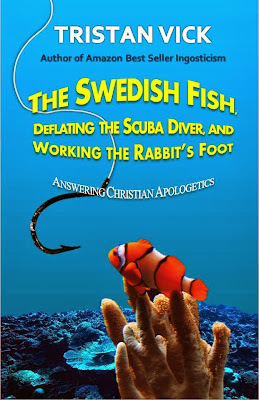 Almost as soon as I had finished reviewing Randal Rauser's apologetic book The Swedish Fish, The Scuba Diver, and Other Apologetic Rabbit Trails, I began receiving emails by those who were following the series and wanted to know if I'd be collecting the reviews into book form. At first I really didn't give it much thought. But by the third email, I realized there was enough of an interest. So, yes, I will be publishing an edited version of the reviews, with ADDED content, more sources and citations, and an slightly more condensed version of the reviews. It will be called The Swedish Fish, Deflating the Scuba Diver, and Working the Rabbit's Foot. Of course, it's an obvious spoof on Randal's title. Besides the interest in this book, I also hope that people can use this counter-apologetics as a way to introduce their Christian family and friends to other ways of thinking that they may not have heard before, and also as a conversation starter. Needless to say, I cover more material than Randal did with far more economy. So it's a good work to introduce to apologist wannabes, to show them that anything they have to say has most probably already been addressed, and that they should read this book before starting a debate with you. Really, that's what this book is for. It's a time saver--for you--so you don't have to waste your precious time debating people who only ever use the same ten arguments again, and again, and again and... well, you get the picture. My book addresses many of the main apologetic arguments, tackles them head on, and leaves them crippled--so that you don't have to waste your time arguing against age old, twice disproved, non-theories about why Christianity is so great and why you ought to believe. Instead, all you'll have to do is point your God believing friends to this little book--and then sit back and watch as their mind turns into a massive pretzel. With any luck, I'll get it completed by the first week of January. Stay tuned in for updates. Happy Holidays to my heathen brethren, and Merry Xmas to all!